myhotpinklife | my journey to a hot pink life! my journey to a hot pink life! those mason jar lights I had mentioned in my quest for pendant lights. The great lady at reclaimed lighting is offering any of myreaders 10% off if you email them at info@reclaimed lighting .com and mention my blog. my brother and sister-in-law recently had a baby with some health issues. they had a stay in the hospital for a time, and are now home with a baby with some special health concerns. i want to bring them some food. several casseroles and a couple desserts i think. but, i don’t want to worry about my dishes back. and they are a bit more particular about food then my family, they like different things. and they have a 3 year old. i haven’t cooked for a 3 year old for years! and i don’t have time. and i have limited groceries. about bringing homemade food. that you take the time to make. so, i wanted to keep on this post. and think about what would be perfect for the next time! i think that disposable pans are the way to go. i can make the casserole in them, and deliver them. these come in all different kinds of sizes–including muffins! then i wanted to have a couple stand-by recipes for food delivery. i personally think homemade-gourmet mac n chz is the ultimate comfort food. doesn’t that just look like it will cure any illness? i realize that i won’t get any health points for this but, its about feeding the soul anyways?!? now for dessert…something simple and sweet. and i think its time for something a bit more healthy? gourmet mac and chz, cornbread muffins with corn and chives, and fresh fruit salad. doesn’t that just scream GET BETTER to the sicky person? well, in theory its a good idea. in reality, pizza is what my brother and his family is getting. that still says love though i hope. chapter 2 of the bedroom revamp. so a few weeks ago i mentioned how my bedroom is always full of other stuff from the house. i mentioned that in my hot pink life i want to have my bedroom become a haven for me and my man. i also have doubts it can happen. so first thing i need to address is the storage problem. we have a small, small walk-in closet and a dresser. that’s it. we need more storage. first idea… repurpose a t.v. armoire we had used until we got a flat screen. then i can get my jewelry, makeup, shoes, and handbags from the closet. they are taking up precious real estate in there. 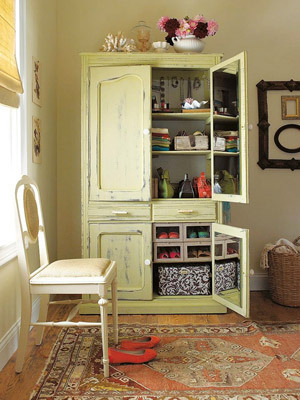 so project #1 is…armoire redo! i also propose under bed storage improvements. old chest at end of bed utilized. or moved for something better. 1. i removed all the hardware. 2. i sanded down the cheap black wood stuff. i really don’t know what it was. it was cheap. and black. 3. first coat of a beigey, yellowy color. leftover from my kitchen cabinets. 5. second coat. that was enough, thank goodness! 6. gently sanded the edges and grooves to give it a worn, vintage look. 7. applied furniture stain. wiped off right away so it got into the grooves and edges. this increases the aged look. 8. put on the great little lion head pulls i had found. and rollers on the feet. ahhh rollers! 9. the interior was outfitted with additional shelves, cup hooks for jewelry, large hooks for purses, bins for makeup, and a mirror (for makeup application). 10. a full length mirror was installed on the outside. final product. ignore the black interior. only you and me will ever see it. how great is this! all from a old t.v. armoire that was about to see the dump. okay, not as cute as the one for inspiration. but hey, i use it. nothing used ever stays looking like a magazine! but it does the job! now just to make the top of it look cute! a nice topiary plant, a vintage window, maybe some artwork from my kids and it should be looking great! i got to go treasure hunting! for housey stuff. two little places near me have occasional sales, once a month-three-day sales of amazingness! but, it will look great in Katie’s room with that new turqoise headboard! my favorite cupcake shop/gifty place uses chicken feeders (clean of course!) to hold rolls of ribbon. this will work great for my craft area in my new office! i was looking at restoration hardware and rejuvenation for a reproduction industrial light. i ran across this instead… i swear this was the find of the day! i think i paid all of $39.00 for it-beat that reproductions! it will look great in the entry of my new office! not really sure why i picked up these vintage checker pieces. i was thinking perhaps magnets for my board or simply sitting in a pretty bowl? who knows, maybe i will find the perfect table for a painted checkerboard top? this little cabinet will work perfect for all the extra computer discs that ineveitably end up in an office. i don’t like the finish, but thats okay–for $8.00 i can paint it up and make it perfect! okay, this lamp got me some flac when i got home. i couldn’t tell at first that the lamp was made from coffee filters. can you? anyways, i thought it looked great–at girly! i love it! its not going to stay home here with my kids artwork and my mini painting—but i put it there for now so i can smile at it. i will find just the right home for it. maybe my bedroom. maybe my office–it will help offset the industrial edge going on in there. who cares–its fab isn’t it! i can’t tell people enough– take time to furnish your home don’t buy something just “because you need it.” make sure your stuff makes you smile. otherwise, it doesn’t belong. life is too short to wast time and energy looking and being around things that don’t make you your best! i love blogs. really love them. it is fun to look at other peoples ideas, get fresh inspiration, and the pictures… love! so it seemed natural that if i love blogs so much i would be able to do a great one of my own?? i am finding this much more difficult then i thought. don’t get me wrong, i still want to blog, i still think i have good things in my life to share. but, i needed to regroup. so, i took some time to stop and evaluate what i wanted in a blog. i stopped over here http://www.4shared.com/get/BXEJWxQZ/bloggingcalendar1.html to pick up a blogging calendar to keep all my thoughts together. i picked up a little notebook to jot my thoughts down. all in an effort to translate my great life, kooky family, and fun house into a blog. some aren’t really blogs persay… but look at that yumminess! gorgeous right! until this blog is up to snuff, enjoy some of these great ones! and hey…let me know of others you think i should check out! we are finishing our 2 car garage into a small office/craft space for me. yeah! i get to pick out all the lighting, flooring, all that stuff! i am stuck on pendant lights over my work space. i just can’t decide what i want. i love the industrial meets girly look. near my desk area i will have a rough wood work table wth a gorgeous chandelier over it. i don’t want to distract or compete from that so my pendant lighting needs to be chosen with care. this is fairly simple but beautiful. and i want the lighting to compliment. so, i am off on the hunt. who knew i could look through hundreds and still not find the right one. and i really am not terribly picky. i think? Its promising to be a cold, snowy day. for our weekly terrific tuesday activity. so… what to do for limited cash. and not spending lots on gas? we used yummy custard as a special filling. isn’t this cute? wouldn’t this be great for a birthday! although, another one that was harder on mom then everyone else. making a cookbook? ! ? i have been promising my siblings a cookbook. for years. with all the recipes they enjoy and love when they come home. and like usual, unless i can do it all out–the best i know how–i don’t do it. well, my sister doesn’t want to wait. she knows it may be forever. she is begging me for a recipe book that she can use in college. do i know recipes that are quick and easy? with only a few ingredients? for a novice? i can’t step away from a challenge. especially with cooking. so…a recipe book shall happen! but, i know i will have to settle on something more manageable. so, i scoured the internet for ideas. some ideas included a 3-ring binder, photo book, pasting recipes onto notebooks, flip albums, and lots more. i decided first to try the website i have heard so much about, tastebook.com. this website is supposed to take all my recipes and make me a great looking cookbook. for cheap. well, not cheap cheap. but almost as cheap as all the materials and ink i would need to do it myself. worth a look. i went to bring my recipes over from allrecipes.com. it doesn’t work with that site. what?? strike 1. but, it does work with epicurious. that’s something…i guess. it doesn’t upload word documents (i have most of my recipes saved to my computer). i have to enter each one individually. its fair i know. i was just hoping for…?? so, i needed to decide if i wanted to go thru the trouble of entering all that information. or, if i was going to write them all out for tastebook or if i want to do it on my own word document and print my own pages. i stewed on it for a few hours. it was still friday and i wanted to do this on saturday. i decided for my siblings, and for my first try, i would do just good enough. (i can’t believe i said that!) on top of that, i have tons of scrapbooking supplies to use. they are free. yep, free and available. nuff said. not much. that’s what. i had plenty of fun paper and decorations. and some refill pages for a 8 by 8 scrapbook. and started printing out recipes. some needed to be typed out. that was okay, it meant i could my own personal notes on the recipes. change of plans. again!! went to the W-store and they don’t stock 8by8 scrapbooks. in fact, they have a very limited supply of scrapbooking stuff at all! what?!? so i settled for d-rings, sheet protectors, and file seperaters. i was going to put the recipes on pretty paper in each protector. too sick of it. i just stuck those recipes in the protectors straight up, right off the printer. my sister loves it. i hate it. i really did “just good enough”. i have once again beaten the superwoman syndrome, in a small way. this is the finished project. i realize that this does not properly reflect my skill or creativity. that’s ok, it allows me to be “hot pink” in other ways. watched Extreme Couponing the other night. it made me shocked. impressed. disgusted. jealous. i should be doing SOME couponing at least. i don’t coupon. not one. hardly ever. i didn’t even give it a passing thought. until…. the crazy lady on Extreme Couponing made me feel inadequate. seriously, she paid like 6.00 for about 600.00 worth of groceries. how much time is needed to make a good effort? or is this a part-time job? don’t get me wrong, saving over 500.00 is definently equal to some part-time jobs. so for her, maybe thats the way she looks at it? and in reality, after printing. after time. after gas going to each store. and the storage… jeepers! extra freezer and fridges. how much do you save? really? so i am testing this out. i am going to spend an extra 1/2 hour looking for coupons for my next grocery trip. only things already on sale. and only for 1/2 hour. lets see how good i can do…. It is expected to FINALLY hit 70 degrees here in my neck of the woods. FINALLY! this winter lasted forever! and a bit of a downer, snow is expected again this weekend. i am thinking about bbq season and all the fun that brings! one of my favorite parts is making things look pretty. some of my favorite bbq hosting tricks and tools. cooler for drinks is a must! the old washing machine works well. feeding trough, wagon lined with plastic (my personal fav), cheapo plastic buckets, large baskets lined with plastic, giant pots, aluminum garbage cans (clean), even a …*gasp* cooler! whatever you choose, keeping your beverages cool is an essential! do NOT forget to have a large, visible garbage can for your guests! doing this will save you trouble later on. AND-keep your space looking nice and neat throughout the day. let’s face it, garbage is garbage. it can look gross. keep the can away from the food. bees tend to hang out around the cans. if you want to put it tucked away–make a large sign telling where it is! paper towels, and such for guests to wipe sticky fingers. be cautious of your choices with food. do you want to have to keep the food cool all day? serve and then put away? or serve food that can sit outside in simple coolers and be fine? you need to have adequate seating for all your guests. this can be a variety of seating. it doesn’t all have to be fancy patio sets! i have several picnic tables throughout my yard that work great for informal uses. notice the layered tablecloths and beautiful flowers. very pretty! and add some fresh flowers from the garden. simple and rustic. i plan on using this even on my INDOOR parties! cheap, and wow are rocks easy to find! but the cutest part is that bucket with the note attached. my ideal outdoor party would have a couple of these adorable tables scattered around on my perfectly green grass. happy bbqing all! my yard is calling my name! finding something to giggle at EACH day! a serious, hurts hard, makes me cry giggling. Real Simple Magazine great magazine–and website! smartpad app great app for time management! the scramble great meal planning site!